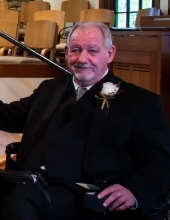 Curtis Landrum Rodgers, 68, of Woodstock, GA, loving husband, father, son, and brother, passed away on Saturday, January 19, 2019. Curtis was born on September 12, 1950 in Toccoa, GA. He attended Toccoa High School, earned a bachelor’s degree in psychology from Kennesaw College, and a master’s degree in rehabilitation counseling from Georgia State University. Since 1996, he was employed as a counselor at Shepherd Center where he co-established the Benefits Navigator Program, which provided social security benefits counseling and assistance to countless Shepherd Center patients and families throughout the state of Georgia. Curtis was at his happiest when he was exploring nature, and maintained an interest in hiking, camping, and fishing throughout his life. He frequently combined his love of the outdoors with his passion for painting to produce incredible works of art. On clear nights, he could be found gazing through his telescope at the stars, whose names he could recite upon sight. His interest in history led to an ongoing genealogy project: an ever-growing chronicle of his family tree. Curtis is remembered by his family for his quick wit, his endless wisdom, and his loving heart. His peers at Shepherd Center remember him as a bottomless well of guidance, patience, and kindness. Curtis was preceded in death by his father, Ray Rodgers. He is survived by his wife of 47 years, Deborah Wilkinson Rodgers, his son, John (Bethany) Rodgers, mother, Johnnie Garland Rodgers Perry of Flowery Branch, GA, sisters Marie (Joe) Lasseter of Watkinsville, GA, Cyndi (Ron) English-Alford of Flowery Branch, GA, brothers Perry Rodgers of Augusta, GA, and Andy (Cathy) Perry of Acworth, GA, and a loving family of nieces, nephews, cousins, and in-laws. Memorial service will be Sunday, January 27, 2019, 3 O’clock p.m. in the Hillcrest Chapel of the Acree-Davis Funeral Home with The Reverend Jerrell Beatty officiating. The family will receive friends at the Acree-Davis Funeral Home on Sunday from 1:30 p.m. until the service time. In lieu of flowers, donations may be sent to Shepherd Center (2020 Peachtree Rd NW, Atlanta, GA 30309) or Paul Anderson Youth Home (P.O. Box 525, Vidalia, Georgia 30475). Acree-Davis Funeral Home is in charge of the local arrangements for Mr. Curtis Rodgers. To send flowers or a remembrance gift to the family of Curtis Landrum Rodgers, please visit our Tribute Store. "Email Address" would like to share the life celebration of Curtis Landrum Rodgers. Click on the "link" to go to share a favorite memory or leave a condolence message for the family.